Word Pronunciation; Discover the Secrets to Speaking Clearly. When you learn English, or any language, you can't forget about word pronunciation. Making sure that your word pronunciation is good, allows you to communicate clearly and effectively with others. Surprisingly though, many students do not learn how to properly pronounce English words and many teachers do not emphasize proper pronunciation. Many students feel that they can not improve their pronunciation alone (without a teacher) but I believe that you can. With the help of eEnglish (a 100% online program that provides you with 5 powerful courses) you can improve your pronunciation from the comfort of home and without a teacher correcting you. But before we start speaking about how to improve your pronunciation, I thought you might find a couple of videos by Amy Walker quite interesting. She speaks about how to learn different accents. Amy really is amazing! Notice how she changes her accents throughout the videos! Enjoy! Find and use effective ESL pronunciation activities to make learning fun. Make learning pronunciation simple and convenient by finding a good portable pronunciation course that you can take with you anywhere.Your time is valuable...spend it using an interactive pronunciation course. Learn how to use pronunciation symbols to help you correct your own mistakes.This allows you to improve and learn, without the help of a teacher...giving you freedom and flexibility while you learn. Get a good pronunciation dictionary. Pronunciation of words can be made simple with the help of a good dictionary.Remember those pronunciation symbols? This is when you can use them. Learn the difference between American and British pronunciation. The differences are not as big and scary as you think.Don't let fear limit your learning. How to Pronounce 'Singer' and 'Direction'? Want to ask a pronunciation question? Click here to ask Charles Becker himself. 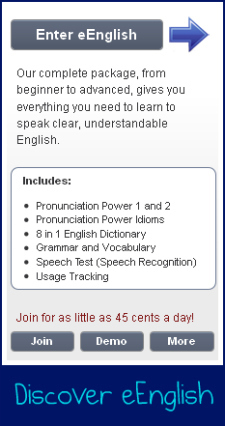 Visit the English pronunciation question area for tips and suggestions.